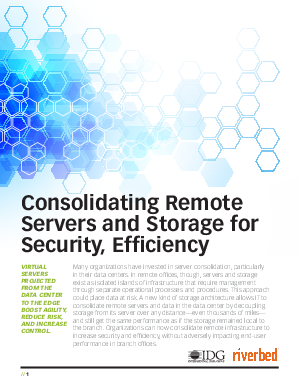 Many organizations have invested in server consolidation, particularly in their data centers. In remote offices, though, servers and storage exist as isolated islands of infrastructure that require management through separate operational processes and procedures, placing data at risk. A new kind of storage architecture allows IT to consolidate remote servers and data in the data center by decoupling storage from its server over any distance and still get the same performance as if the storage remained local to the branch. Learn how organizations can now consolidate remote infrastructure to increase security and efficiency, without adversely impacting performance in branch offices.